Firenze del Brunelleschi - FLORENCE LIVE! Filippo Brunelleschi conceived of the city as a rational, new order--a fusion between the present and the past which would establish a new way of seeing and understanding--i.e., the Renaissance. This included a new concept in town planning, one comprised of numerous and diverse elements but perfectly united and methodical according to a rational, precalculated hierarchy. This was a completely logical design in every respect. 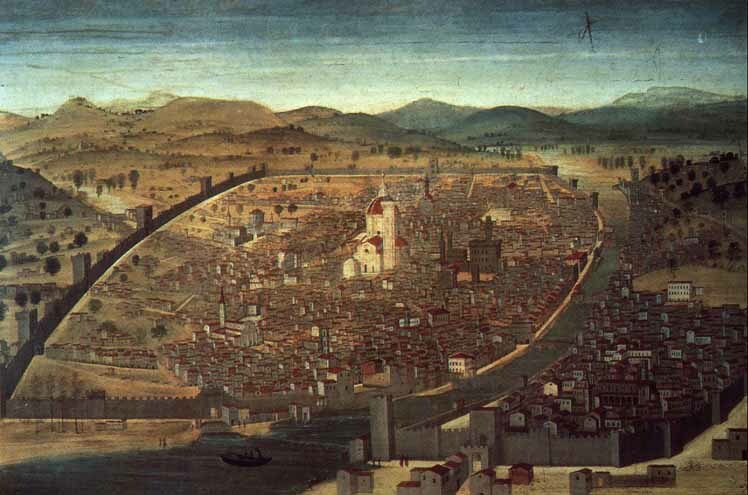 So as not to disregard the valuable attributes of the medieval city, "rather, actually using its intelligence as a point of departure," Brunelleschi incorporated the existing structural traits in his renewed vision. Florence's 14th century transformation from a typically medieval community into the Renaissance city it remains today is attributed to the influence of Filippo Brunelleschi. The founders of the Humanism movement, using Florence as the home of their new school of thought, declared it the ideal city. Reconstructed dimensions of a design for a cathedral and dome proposed by Arnolfo suggest that his was to have been a rather prominent, conspicuous structure, yet equivalent and symmetrical to the Palazzo Vecchio and its tower. Brunelleschi's cupola, rather, departed in design from its function as a sacred building and became somewhat of a symbol of Florence's new, urban organization.